a.k.a. Everything But the Kitchen Sink Salad! I must say... this was really delicious! The combination of vegetables (beets & red onion), protein (brown lentils), whole grains (barley & quinoa), and heart-healthy fats (walnuts) really hit the spot. I've been craving beets lately, which isn't the worst thing in the world since they might do everything from fight cancer to clean your liver. Not too shabby! This was great both warm and refrigerated. 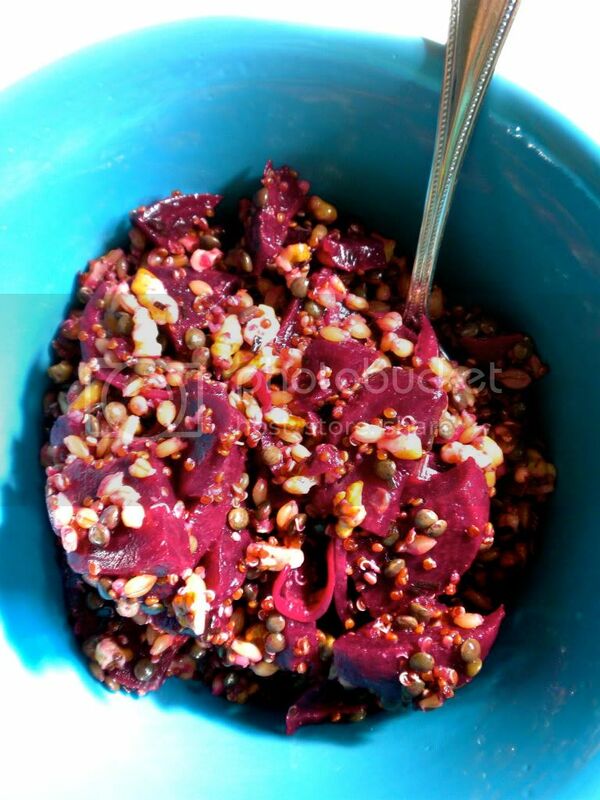 And between the pink beets, red quinoa, and earthy brown lentils, it's a looker, too! 1. Wash the beets and remove the tops, but leave a bit of the stem. (No need to peel! The skin will slide right off when the beets are done cooking.) Cook beets in boiling water. Cooking time depends on the size. I used my new pressure cooker, which only took about 15 minutes, but conventional boiling could take anywhere between 30-90 minutes depending on the size of the beets. 2. Thinly slice the onion into half moons. If you don't love the taste of raw onion, throw the ribbons in with the for a few seconds as they finish cooking. 3. While the beets simmer, cook the lentils, barley, and quinoa. Start with the barley, which takes longest, then the lentils, then quinoa. You can try to time it all in the same pot but I just cooked them one at a time. 4. Toast the walnuts in a dry pan over low heat. When the beets are fork-tender drain them and careful remove the skin under cold water. 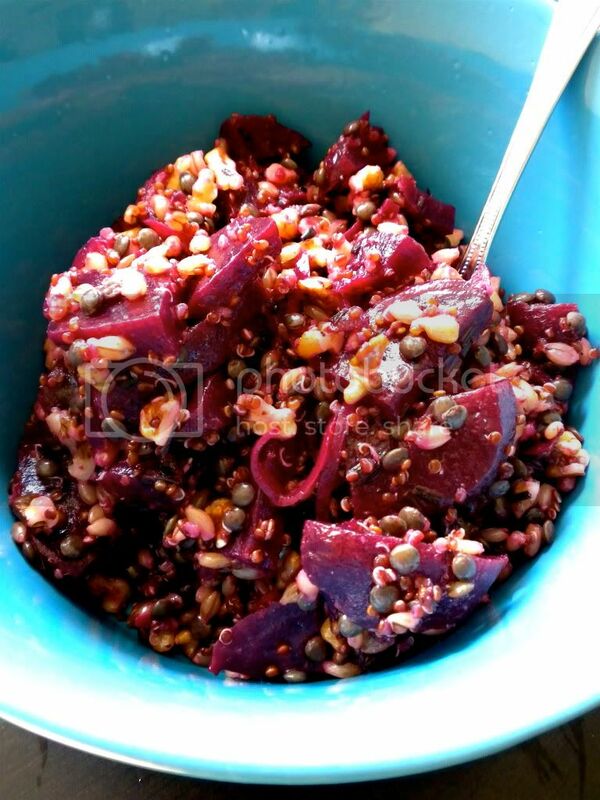 Slice the beets and toss with the onion, cooked barley, lentils, and quinoa. 5. Toss everything with the vinegar, olive oil, salt and pepper. Devour. Refrigerate leftovers (if applicable). I'm so glad you enjoyed the recipe! I can't get enough of beets recently; I'm on a real kick! 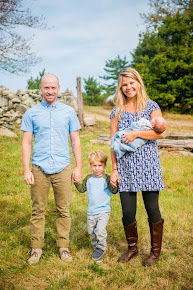 Thank you so much for letting us know what you thought and for visiting Two Blue Lemons! This looks delish ladies! I'm excited to give this a try. I'll blog about it when I do :) I love beets, they make everything so pretty haha. Made this for lunch today, so tasty! I added some goat cheese for a little calcium boost, but it was great without as well. I'm so glad you liked it! The goat cheese sounds delicious. Thanks so much for sharing your take! yum! sounds great, and easy! After making this tonight, this is one of my new favorite recipes. I made a few changes: I roasted the beets and onions, added feta, and left out the barley to make it gluten free. It was so delicious. Thanks! this looks so delicious! great post! The uplifting news are: there's still time to act preventively. Do yourself (and those you adore) a major support: get that fit of anxiety treatment that you realize you require so much today.